Enerpac pipe benders are delivered in complete sets, with a sturdy steel storage case and an angle indicator for accurate bending. Pipe benders are lightweight and extremely mobile tools and can therefore be used in places that are not easily accessible. The benders and bending shoes are made from heat-treated aluminium, which is light and incredibly strong. 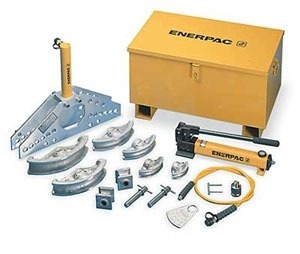 Enerpac pipe benders can be delivered with or without hydraulics. Laco sells and rents pipe benders. It is wise to contact Laco before purchasing an Enerpac pipe bending set. The specialised Laco advisors can tell you everything you need to know for being able to use your Enerpac pipe bending set in a safe and reliable way. They can also advise you on additional products and answer any questions you might have.